In Peoria, IL, Running Central, a community staple since 1977, has given way to RC Outfitters, revised branding that better reflects the retail environment owner Adam White and his team have created. Central,” says White, a Peoria native and prep running star in the central Illinois city. “If you’re not a runner, but need to be properly fit, would you be comfortable at a place called Running Central? That was a barrier to entry and I knew it.” Still, though, White hesitated to drop the name during that substantial 2014 project, one that also included broadening and diversifying the store’s inventory into more lifestyle categories. He retained the Running Central moniker, deferring to a name that had been a community mainstay for 40 years. On March 13, Adam White revealed the re-branded RC Outfitters during a fourminute Facebook Live session, detailing the reason behind the changes. The store’s new look replaces the showroom (below) that prominently featured Ned, Running Central’s longtime on-the-run caricature. 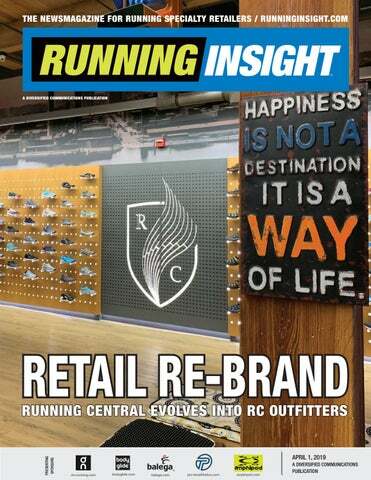 Adam White decided to re-brand Running Central as RC Outfitters when it became increasingly apparent that customers were overlooking his diverse inventory assortment, which included running footwear as well as causal wear such as denim (below left) and dresses. White aims to make RC Outfitters a comfortable place for customers to visit and linger, something he looks to accomplish with twice-weekly happy hours. Flat Stitch Technology allows customized stitching to achieve 3D shaping of the fabric for an optimum ﬁt. Alleviate symptoms of pain, minor soft tissue tears, strains, tracking issues, Tendinitis and Arthritis. Medical grade compression ranging from 20mmHg to 30mmHg depending on compression zone location. or the vast majority of running stores across the U.S., social media stands an integral part of the marketing mix, but often one run shops struggle to utilize in the most effective ways possible. While popular platforms such as Facebook, Instagram, Pinterest, Twitter and YouTube offer running retailers a direct, cost-effective way to build brand awareness, strengthen existing connections and demonstrate the authenticity so core to the run specialty channel’s being, achieving those objectives stands an ongoing battle. Much of that struggle resides in uncertainty. Though many run shops remain adamant about being present on select social media platforms, the mechanisms and moves to more successfully pull social media’s levers, particularly in ways that ultimately drive traffic and sales, aren’t always clear. Enter the 10 Commandments of Social Media for the run specialty retailer, a set of guidelines and principles designed to help running stores more effectively leverage social media and spark more productive outcomes. The all-new Cloudswift featuring Helionâ&#x201E;¢ superfoam. Run on clouds. Social Media Commandments (continued) you achieved your goal — and, if not, what you can change to meet it next time,” Fiedler says . self-serving with constant store announcements. “Think about how you can be a problem solver and share solutions that will enable your audience to thrive,” Burke says. VIII. Thou shalt embrace profesionalism. While some retailers might post the exact same message on each of their social media platforms, Fiedler recommends defining a voice for each specific social platform. Twitter, for instance, lends itself to more newsy content, while Instagram relies on strong visuals. “Think about who is seeing your content on [each] platform and what they may be interested in,” Fiedler says. Social media pages for a business directly reflect on the store, its staff and its brand. If the store’s vibe is whimsical, sophisticated or quirky, don’t be afraid to embrace that in genuine ways. But resist the political commentary and off-color jokes. To generate content ideas, consider starting with common in-store conversations that staff have with customers, whether that’s related to cold weather gear, training, injury prevention or local running spots. “Think about the questions that customers commonly ask in-store and translate that information into your posts on social media,” Fiedler says, adding that retailers can access specific running industry content on Promoboxx to support their posting needs. Video continues to become one of the globe’s prime mediums for digesting content. To wit: Alexa reports that YouTube sits behind only Google as the world’s most trafficked website. That said, Murans encourages retailers to make video a central part of their content strategy. “Video communicates more than any other medium and is the best way to create engagement on social media,” she says. X. Remeber thy is human. “RUN BOS” along with a silhouette of the state of Massachusetts in the insole to emphasize New Balance’s continued commitment to the runners of its home city. This limited-edition style is built on New Balance’s cult favorite 890 running shoe with updates and a new attitude in the 890v7, combining innovation and nostalgia. A UNIQUE PERSPECTIVE ON THE WORLD OF RUNNING. Next-Generation Racing Shoes Dominate NYC Half Belay Tilahun pulled off a surprise win in the United Airlines NYC Half on March 17 in New York City, taking the lead only in the final kilometer to grab the men’s title. Tilahun, a native of Ethiopia who lives in New York, was entered by West Side Runners and started just behind the invited pro athletes. He quickly joined the lead pack and ran strong enough to finish in 1:02:10, besting a deep pro field that included Eritrean Daniel Mesfun (2nd, 1:02:16) and American Paul Chelimo (3rd, 1:02:19). Not surprisingly, all three of the top men wore various editions of Nike Vaporfly 4 percent shoes. New Indoor Mile World Record Yomif Kejelcha set a new indoor mile world record at the Bruce Lehane Invitational on March 3 in Boston. The 21-yearold Nike-sponsored Ethiopian coached by Alberto Salazar in the Oregon Track Club clocked an eye-popping 3:47.01 to demolish Hicham El Guerrouj’s 1985 mark (3:48.45). It was the first indoor mile race to produce two sub-3:50 efforts, as American Johnny Gregorek (ASICS) finished second to Kejelcha in 3:49.98, the sixth-fastest ever and second behind Bernard Lagat in U.S. history. The record came after Kejelcha narrowly missed two other indoor records this season. He missed the mile record by an excruciating 0.01 seconds on Feb. 9 at the Millrose Games and then watched countryman Samuel Tefera kick past him to break El Guerrouj’s indoor 1500m world record a week later in Birmingham, England. Kejelcha’s 3:47.01 is the fastest mile run in the world since Alan Webb’s 3:46.91 outdoor American record in 2007. Behind Kejelcha and Gregorek, Sam Prakel (3:50.94, No. 5 U.S. history) and Henry Wynne (3:51.26, No. 7 U.S. history) also turned in breakthrough races. Hawks, Drew Win Chuckanut 50K In the women’s race, world recordholder Joyciline Jepkosgei of Kenya won by a full minute (1:10:07) wearing a pair of Adidas Adizero Adios 3. Also in the top 10, several runners donned yet-to-be-released prototype racing shoes, including Jared Ward (4th, 1:02:33) and Noah Droddy (5th, 1:02:39), who wore green Saucony mystery prototypes rumored to have a carbon fiber plate embedded in the midsole. Meanwhile, Desi Linden (5th, 1:11:22) turned in a solid race in a tune-up for the Boston Marathon wearing a pair of yet-unnamed Brooks racing prototypes that will debut at the 2020 U.S. Olympic Trials in Atlanta. several hours before the fast heat. The trail racing season got underway in earnest at the Chuckanut 50K in Bellingham, WA, on March 16, and Hayden Hawks (Altra Running) and Kathryn Drew (Kintec Footwear, in photo) looked like they were in midseason form. After finishing a close second two years ago, Hawks returned this year for some redemption and also to get the monkey off his back from a few recent DNFs. He wound up outrunning Andy Wacker, Tyler Sigl and Rob Watson to win in 3:37:34 — the fifth-fastest time in the long history of the race despite having to maneuver through sections of snow, ice and mud. Drew battled fellow Canadian Kim Magnus throughout the race, but sealed a win in 4:26:54 by building a three-minute gap along the fast and flat final 10K section.